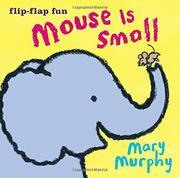 This well-designed board book is a short read that offers big entertainment for little readers. A series of endearing critters of sequentially increasing dimension, presented on pages of likewise increasing proportion, introduce the concept of relative size. Murphy’s simple and easily grasped line drawings have a degree of charm and personality well in excess of their sparse detail. Mouse and friends, Tortoise, Pelican, Zebra, Elephant, and Spider, inhabit brightly colored, monochromatic two-page spreads, each die-cut page on the right slightly larger than the page that preceded it. The pages are thick, very stiff, and easy for even rough little hands to grip and turn without tearing. The text is basic, easily assimilated, and well-matched to the illustrations. The flip-flap gimmick of graduated page size should encourage toddlers to enjoy this book both with their caregivers and independently. The parade of ever larger animals reaches an unexpected conclusion with an amusing reminder that bigger isn’t always better. This volume will be a quick read at bedtime, but it has the potential to become a real favorite of aspiring young readers and page-turners, and it should stand up well to significant abuse from typical toddlers. IS IT BIG OR IT IS LITTLE?